Is Green the New BuzzWord? I borrowed this post from my 9 AM to 5 PM job, I work for a company whose commitment towards the environment is high – and of course part of my job is blogging, hope you like this post and comments are welcome. Sustainability is a topic that has fascinated since I was a teenager. I remember that I used to talk about how the human race where in a process of continual self-destruction by harming the environment. At University, I took a course “corporate sustainability” where I learned that I needed to take a holistic perspective on the business world by creating long-term growth companies with an environmental stewardship culture. For me at the time, increasing the bottom-line while preserving the environment only consisted of giving employees health insurance, giving money to causes or buying from suppliers who utilized sustainable practices. It is today, in my current job, where I have seen the true meaning of corporate sustainability. Corporate sustainability means developing environmental, societal and economic strategies that lead to sustainable actions. For instance, companies that work towards the development of environmental sustainability efforts deploys cutting-edge technologies and implement green programs. It is unfortunate that today, sustainability has become a buzzword among companies, and a commitment to the environment is not always apparent in every aspect of daily operations. By working in the building maintenance and facility service industry, I have been able to determine whether or not a company is totally compromised with the environment or they are using the terms sustainability, recycling, and compliance as merely marketing buzz words to achieve higher profits. Did you know that the prime source of realized cost savings for organizations is to integrate outsourcing into the overall operational framework? Research has shown that outsourcing building maintenance, and facility services to specialized companies enables organizations to gain a competitive edge by saving time and resources, and by focusing on their core business. Companies are concerned about sensitivity to cleaning chemicals; they are looking for BSCs that use biodegradable, eco-friendly, non-toxic and petroleum‐free cleaning products. Companies are currently addressing health and environmental issues in their core mission with the purpose of providing a safe place for its workforce. The increased burdens on local utility and maintenance systems have corporations promoting LEED so that governments allocate financial resources to increase R&D budget within their organizations. 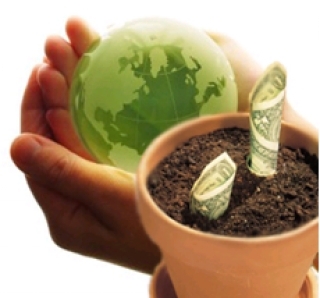 You are likely to gain access to funds or grants if you are contributing to preserving the environment. Green building and cleaning requirements have been made a mandatory prerequisite for earning or upholding LEED certification. The Canadian Government is placing companies and itself under added burden of putting in place green cleaning practices that make compliance an ongoing business reality. Real estate development and property management companies are moving towards the implementation of LEED Programs as a way to continue being building sustainable and compliant with industry standards. Staff is uneducated about the benefits of environmental practices. As an unsolicited advise, I would recommend having in-house LEED APs to train employees in the proper use of chemicals as well as to reduce waste and maximize cleaning efficiency. In Canada, you can take the LEED Green Associate course offered by the Green Building Council; this course allows understanding the basic information about environmental practices in the Real State Industry. Continual improvement must be part of a BSC daily operations routine. I am sure that there must be hundred more business drivers that companies have had to address in the journey of becoming LEED Certified; so, I would like to invite to share with us your experiences. Tell us what are the drivers that presented the greatest opportunities for you? And which ones presented risks to your business?